In the 20th Century the big corporates looked to grand, annual events to cascade strategic plans, and promote innovation and change. Platforms created to inspire, engage and motivate. Shock and awe? We argue, it works no more. The pulpit is giving way to the sandpit where teams come together to discuss and incubate ideas. Think about the billion dollar corporations popping up today. Companies doing in a few years what took others centuries. These aren’t so much led from the front as they are catalysed by inspiring experiences in unique, often temporal (pop-up) spaces – where staff, vendors and even customers come together to generate ideas and quickly move them from aspiration to a scalable reality. 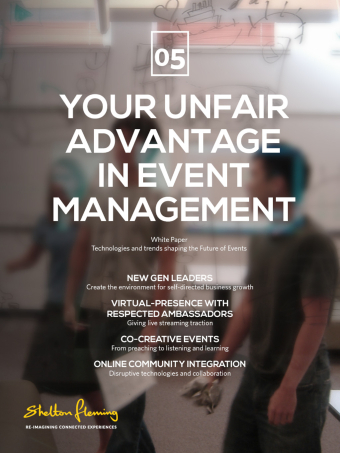 In this new paradigm events are about intense listening, collaboration and near real time, experimentation. Fail. But fail fast. Learn and move on. That’s the new mantra. That’s the modus operandi the live event’s world needs to embrace. Want access? Sign up below! If you sign up to our newsletter, you'll get an email about once a month and we'll never share your details.